To make our delicious McCafe beverates, McDonald’s restaurants use literally tons of coffee grounds and espresso beans each year, which can contribute to greenhouse gas emissions when they begin decomposing in a landfill. Luckily, coffee grounds make a great soil amendment for gardening! Recycling these used grounds gives McDonald’s a great way to connect with customers and crew, and further our waste diversion efforts. To take advantage of this valuable waste stream, McDonald’s USA implemented a used coffee grounds composting program called “Good Neighbor, Good Grounds” in 2015 to reduce the amount of organic waste being sent to landfills. Through the program, participating restaurants re-bag coffee grounds and give them to community members to use in their home gardens or donate them to community gardens. This not only helps the environment, it fosters community engagement and creates connections with the McDonald’s brand. Over 1,000 McDonald’s restaurants in Oklahoma, Hawaii, California, Oregon, Washington and Arizona are now part of this program, including a new partnership between McDonald’s, our franchisees and 150 statewide schools in the Arizona Department of Education School Garden Program! Watch Arizona media coverage on the program here. Recently, the US North West Region confirmed that 380 restaurants are onboard for coffee ground recycling with the community garden connection as of Spring 2016. “January 20, 2016 McDonald’s restaurants across Arizona are partnering with schools statewide to recycle their used coffee grounds and help school gardens grow as part of the “McCafé School Gardens Grow!,” coffee grounds recycling initiative. 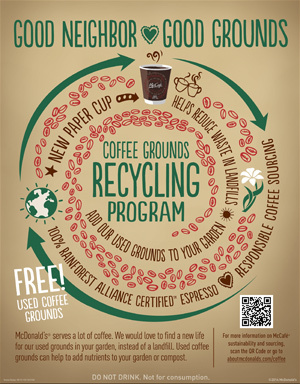 The new initiative is part of McDonald’s “Good Neighbor Good Grounds” recycling program, designed to divert used coffee grounds from the waste stream by promoting the reuse of coffee grounds to add nutrients to soil or compost. According to Phoenix McDonald’s franchisee Dorothy Stingley, 100 schools with the Arizona Department of Education School Garden Program have signed up and are currently utilizing their local McDonald’s coffee grounds in their gardens and composts. Schools pick up the grounds weekly from their local McDonald’s restaurant.